Kate slid the toe of her left boot into the stirrup, stepped off the mounting block, hooked her right leg on the top pommel, settled into the saddle, then twisted around to recheck her various leather bags while quickly arranging her skirt and petticoats. The chestnut mare she had selected stood patiently, a groom at her head. Hugh walked his selection, a tall dark bay mare, in a slow circle. Both horses were thoroughbreds, and guaranteed by the riding school to be reliable hunters. “Thank you,” Kate said to the groom as she gathered her reins. “Muh lady.” He knuckled the peak of his cap and strode away, dust rising from his worn boots and canvas gaiters. “I’m ready, Mr. Wansbrough,” Kate called to Hugh. “Excellent!” He smiled and turned towards the nearest open door. Isabel stood outside in the sunshine, on the pavement by another larger set of doors, peering into the relative gloom of the covered riding ring, where several students practised some of the finer points of dressage under the strict instruction of the masters. When Kate and Hugh emerged onto the cool bright street, they stopped to allow the eyes of the horses adjust to the light. Isabel scurried over to them, manoeuvring beside her young mistress, well away from Hugh. “You’ve got all you need, my lady?” she asked. “I put more handkerchiefs in one of your bags,” the maid whispered. Isabel scowled suspiciously at Hugh, an expression he couldn’t perceive but Kate saw clearly. “I’ll be here waiting,” she stated with a firm nod. Hugh and Kate walked their horses into the steady stream of slowly moving coaches, carriages, and horse riders, then they were underway to Farleigh Castle. All had gone to plan. Kate prepared the path, so when Hugh called two days previously, Lord and Lady Beaufort were expecting him, and not at all surprised by the suggestion of some exercise achieved through a countryside ride. To include a visit to the castle proved only a matter of simple hints and finally an eager request. The stepmother had advised caution, but the smiling bright-eyed daughter easily swayed the doting father, assured of propriety by the young gentleman’s flawless reputation and respected family. Kate wore her exquisite dark green velvet riding habit, a lacy white satin shirt, cream-coloured waistcoat, black silk neck-kerchief, black peaked cap with stiff round flat crown and dangling tassel, and layers of warm undergarments. She styled her hair with a braid off each temple, looped to her back, tied by a ribbon with the remainder of her long wavy silken tresses. Subtle cosmetic applications to her eyes and lips completed her semblance. Kate thought she looked very smart, indeed! Hugh wore mostly black (top hat, tailcoat, waistcoat, neck tie, and shiny jackboots) except a dark red collar on his coat, tight buckskin riding pants and, of course, a crisp white shirt. Kate kept her eyes on the carriages, children, and dogs darting about, but did occasionally glance down at her outfit, or at Hugh. We both sit tall in the saddle. My habit is much finer than his suit. He’s handsome, well turned legs, killer breeches… a crimson waistcoat is what he needs – that would be a better choice than black. Crimson goes nicely with the creamy beige of buff leather. I should have something made with beige and crimson, and could wear the Burmese ruby pendants and brooch with it. Kate thought of the portrait of her queenly mother, wearing the deep red jewellery, hanging in her father’s library. The precious stones were brought out of Burma by Kate’s grandfather, Sir Thomas Roberts, as a gift for her grandmother, and then passed down to their daughter, Kate’s mother. Sir Thomas, a retired general-officer, and Kate’s only surviving grandparent, spent most his time in India, visiting England infrequently. I wonder where grandfather is now? 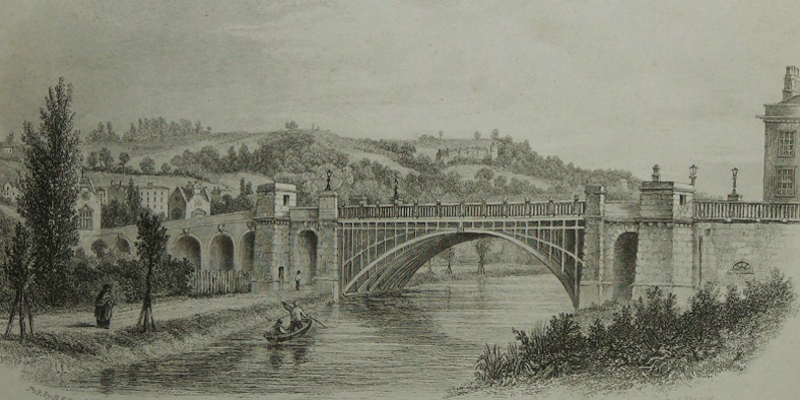 North Parade Bridge, Bath, depicted circa 1840, built 1836 of eight cast iron arches, rebuilt in 1936. Kate quit her thoughts of family and looked ahead to North Parade Bridge, pleased to see some open road. They crossed the river, continued east, passed under the railway, arrived at the canal, and followed the busy towing path south past three locks. Long thin boats loaded with cargo queued for their turn through the locks, docile draught horses pulling them stoically. After crossing the little stone bridge Hugh had mentioned, the road immediately began climbing into the hills, leaving the traffic behind, and they could ride abreast. Kate appreciated the scenery and fresh air (no longer flavoured with coal smoke), and from the corner of her eye noticed Hugh peering at her frequently. “Have you enjoyed your visit to Bath, my lady?” he asked. Kate didn’t comment and thought of the upsetting afternoon in Sydney Gardens. She replayed the suspicions voiced by Isabel and Miss Pierce in regards to Hugh, and pondered whether she should tell him now of being followed by a tall thin man in a black suit to gauge his reaction. “The other day you mentioned a need for dance lessons?” Hugh prompted after perhaps a minute of silence. Kate laughed, and Hugh joined in as the road dwindled to a lane, which then forked left and right away from the higher country. 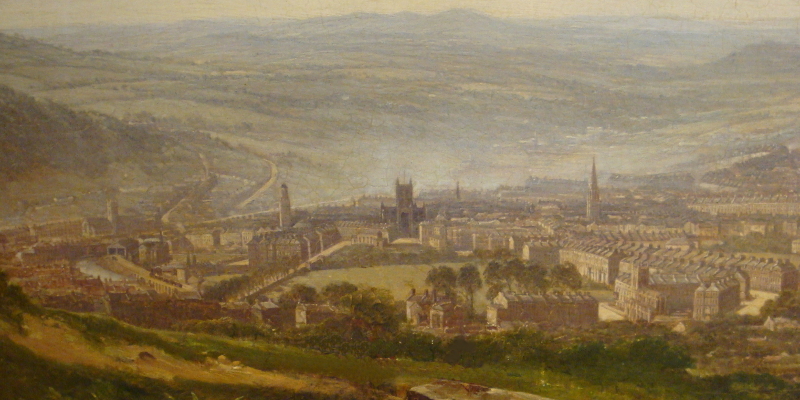 Bath From the East, by J. Syer 1849. Kate’s view would have been from farther south. Hugh urged his mount into a trot and split the fork in the lane, heading onto a trail. Kate kicked up to a canter, passing him and, upon spying open field, tapped her horse with her whip. Hugh appeared at her side, and both horses increased the tempo of their canter, faster, faster, then broke into a gallop. They raced over the crest of a broad hill, hedgerows at oblique angles closing in around them. Kate saw Hugh pull back to a canter and did likewise, then they eased to a walk before coming to a gate. “That couldn’t have been much more than a furlong,” Kate said with a note of disappointment, patting the neck of her horse. “Would you risk jumping with an unknown mount?” Hugh asked as he pulled the gate aside with his riding cane. Fine views of the pastoral valley stretched before them as they plummeted from the hills into some old growth forest. They alternated between gaits depending on the terrain, and entered Limpley Stoke after a decent gallop beside the river. Hugh led them to the front yard of the Hope Pole Inn and leapt from the saddle, then hurried to Kate’s side. Kate nodded and freed her left foot from the stirrup, unhooked her right leg. She swivelled, pulled her skirt clear of the top pommel and wrapped her reins around it, then reached down for Hugh’s shoulders; he grasped her firmly at the small of her waist. Kate felt his hands squeezing through her corset. Previously, last June, Hugh had taken her weight at the armpits to help her dismount. This time, as he lowered her, it was rather like they were embracing. Kate felt a flush of warmth in her breast at the intimacy. They stood for a heartbeat, eyes locked, then she slipped her hands off his shoulders, almost accidentally striking him in the face with her whip, and turned to her horse. “Good girl,” Kate cooed and felt under the saddle flap to determine if the animal was overly hot. Through her glove she sensed a normal warmth, and she found little sweat. “Please.” Kate gathered her skirt. 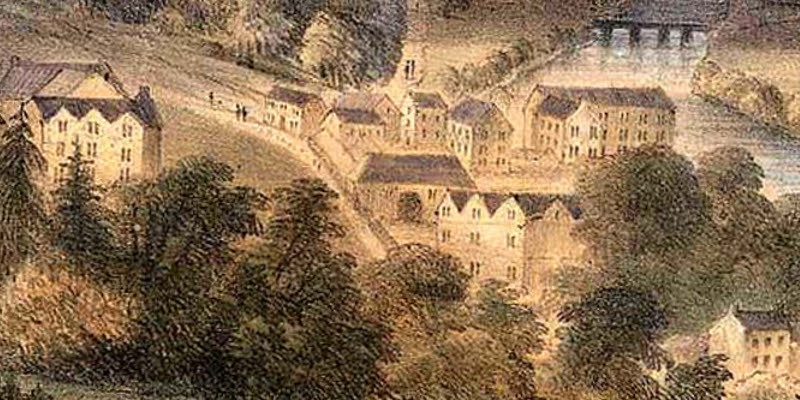 Limpley Stoke, by Elizabeth Tackle, watercolour, circa 1850. They sauntered through the front door of the inn and into a dimly lit taproom of dark wood with a window at the far end, a crackling fire in the open hearth halfway along one wall, opposite the bar. “No… I suppose we are dressed rather like hunters,” Hugh replied. Kate blinked in surprise. Comely sister?! A thin young man in work clothes and an apron answered the summons by peeking into the taproom from the hall. Kate made her way back to the taproom and found Hugh, holding two steaming pewter tankards, seated by the fire. He stood and offered the seat to Kate, giving her one of the drinks; the sweet aroma of spiced cider filled the air. She smiled, perched on the chair and took a sip. Hugh pulled up a chair and sat beside Kate, their faces orange in the firelight. They drank in silence for a minute. Hugh glanced over his shoulder at the innkeeper a couple times. “The common man is a simpleton,” Hugh said under his breath. Kate took another sip and stared at the dancing flames. All common men? The Wansbroughs are commoners. Why make such a statement? How do I respond? “You and I have a natural affinity because of our intellect and consciousness,” Hugh went on. “I think so.” What is this about? Kate nodded and took some large but still ladylike swigs. Hugh placed the empty tankards on the bar, and they stepped outside, the innkeeper following them. They guided their mounts to a water trough for a moment. Kate then led her mare onto the road where it slanted downhill, and stood on the stone embankment of the yard to mount. Hugh swung into his saddle and they were once again on their way to Farleigh Castle. “Come anytime!” the innkeeper called and waved. “He certainly wants our custom,” Hugh said as they followed a road through the village. 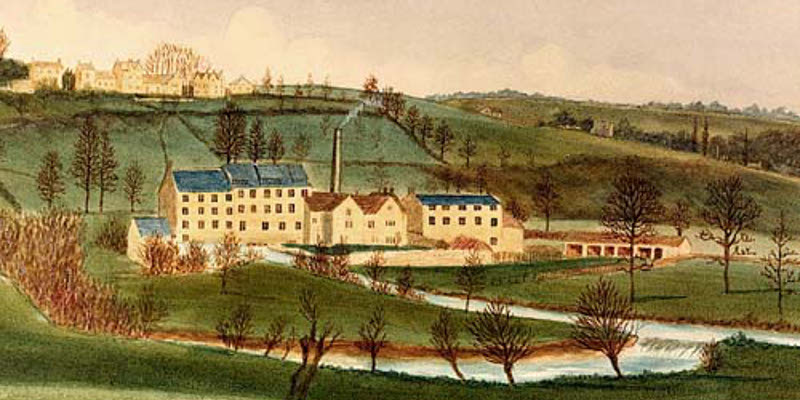 Freshford Mill, mid 1800s. Kate and Hugh would have passed on the left, coming over the hills from Limpley Stoke. They rode the suggested route, passing by the mill outside the village of Freshford, and were soon racing across a broad pasture, woods to their right, the river on the left. Their horses were evenly matched, and ran together instinctively. They reined in to a walk while navigating around some farmyards and thick copses of trees. “How longer will you remain in Bath?” Hugh asked. “Oh…” I don’t like that! Kate kicked to a canter and headed south. They crossed a lane and skirted another farmyard, then galloped wildly through a series of verdant fields, halting at a gate. Kate gazed through the trees and descried the tops of crumbled stone towers. They rode up from the valley, around a couple cottages, and entered the ruins; the foundation stones of walls and buildings, two gutted towers, partial walls, an intact chapel surrounded by a crenelated wall, then a high ivy covered wall and gateway. Woolly sheep meandered placidly under the watchful eye of a collie and an old shepherd, who sat on a stone smoking a pipe. Kate wondered if the expecting ewes were in a barn somewhere, and if some lambs had already been born. Farleigh Castle, engraved by T. Nelson & Sons. The church and gateway are featured. They dismounted, Hugh once again assisting Kate, removed the bridles, saddles, and bags from the horses, quickly rubbed them down, and tied them where they could rest and graze on the stubble, then prowled through the ruins. Hugh spoke about the Hungerford family, their support of Parliament against King Charles I, the occupation of the castle by the Royalists under another Hungerford, and recapture by the Parliamentarians. Kate listened politely, but was more interested in the medieval history when her ancestor lived there for roughly a year. She did stop and stare across the expanses of lawn a few times, hoping to spy the spirits of Royalist cavaliers and ladies promenading arm-in-arm, but had to be satisfied with her imagination, which soon concocted dark shadows of highwaymen mustering stealthily in the ruins by moonlight and preying upon unsuspecting travellers, which led to her thinking yet again of being stalked by a man in black. They scrambled into the most intact tower and looked up at the sky, the gaping windows, and fireplace. “This is all very interesting,” Kate said, eyeing Hugh carefully. Kate abruptly questioned the wisdom of confronting Hugh in this fashion. Feeling intimidated, she turned away and made a slow ambulation around the inside of the tower while relating to him what had happened. Hugh seemed perplexed, the colour returned to his face, and he asked some questions. “No.” Kate shook her head. “Now, Kate.” He grinned and popped on his hat at a jaunty angle. “Shall we view the curiosities?” He offered his elbow. Kate took it willingly, glad to display trust and friendship. They clambered out of the tower and over a few low crumbled walls, Hugh overacting the role of attentive gentleman and needlessly helping Kate, then they strolled up to the churchyard door and descended into a little yard on worn stone steps. A plainly dressed elderly man, small and wizened, set his rake aside, tipped his tattered cap, and opened the church door for them. Kate passed through the entranceway and slowly stepped down into a modest nave, her eyes adjusting to the dim light. She observed walls bedecked with weapons, helmets, breastplates and shields, suits of armour on racks, ornately carved chairs, tables, a stained-glass window and murals on the far wall above an altar. 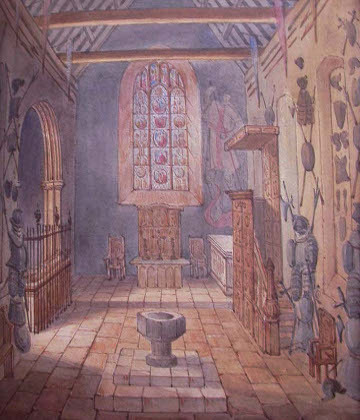 A tomb made up part of the flagstone floor directly afore her, then a ponderous stone baptismal font on a dais. She heard Hugh exchanging some coins with the small man. 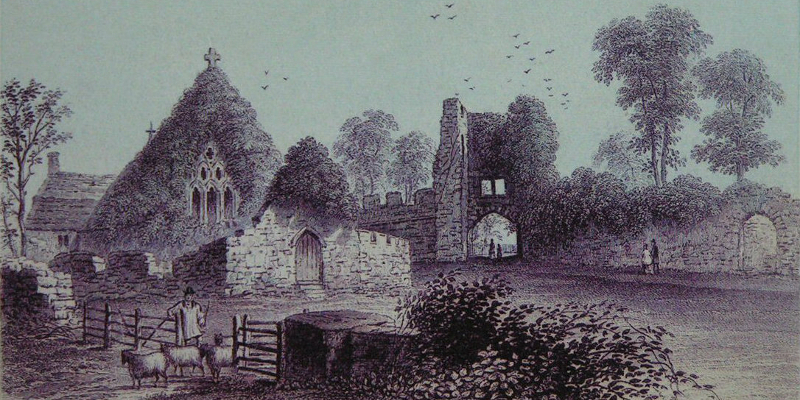 St. Leonard’s Chapel, by J.E. Jackson, watercolour 1878. When Kate visited the displays weren’t as organized and included several odd assortments on tables. “Please don’t disturb anything, sir,” the man begged. The muffled words were lost as Kate started mincing along one line of armour, focusing on a larger than life-sized depiction of a knight, stabbing downwards with a lance, painted beside the window, over a smooth topped table-tomb, and behind a wooden pulpit. Hugh came bounding down the stairs. “Did you already see the Cromwell artefacts?” he asked, pointing to a table. Kate turned back and joined him. There were enormous flintlock pistols, a pair of thigh-high riding boots with folded shafts, the leather worn, dry, and cracked, and several letters laid out with the signature of O. Cromwell clearly legible. “When was this church built?” Kate asked while hefting a pistol. Kate set down the pistol and approached a table of damaged pottery, but was drawn to the small side room, the space better lit by three windows, revealing a black and white checked floor and more paintings. A double-tomb of a knight and his lady, embodied by recumbent grey stone effigies, surrounded by a high decorative wrought iron railing, straddled the archway between the chapels. Beyond lay two table-tombs filling the corners, and a splendid double-tomb with white stone effigies, a placard in bold letters proclaiming them to be Sir Edward Hungerford III (commander of Parliament’s Wiltshire forces) and his wife, Lady Margaret. On the walls were depicted rows of shields, many of them similar and likely representing members of the Hungerford family, but others too. Kate searched in vain for her ancestor’s shield, but the closest was a rendering of six black martlets on two fields of yellow, divided by a single diagonal (bend dexter) stripe. Kate returned to the main chapel and stood beside Hugh. He indicted large round bullet holes on several helmets and breastplates. “More Hungerford tombs?” Kate led the way outside. They walked to the side of the church, to a covered staircase in a corner where the chapels met. Thick vines draped the doorway and covered the slate roof. The door was open and two lanterns lit the stairs. Hugh removed his top hat and set it on the grass, descended a few steps, passed a lantern to Kate, then took up the other and continued down, crouching over lest he bang his head. Kate aped his posture, staring wide-eyed into the shadows, smelling an earthy and musty odour. She accepted Hugh’s proffered hand for the last steps into a sort of antechamber and expected to see tombs with recumbent effigies. Instead, through an opening, she viewed a small room with an arched ceiling, human-sized grey bundles upon the floor. Kate drew up short. Hugh tugged her hand, their gloves providing a secure grip. Kate edged forward, holding her lantern high. She glanced at Hugh. He watched her, grinning broadly. The grey forms came into clearer view. Kate discerned solid construction, human shaped, five adult-sized coffins in a row, then realized another one lay immediately to her left. She flinched, and jerked her hand free, causing Hugh to stumble. Kate fixated on the coffin, then perceived a feminine face, and the shape of an infant resting on the torso of the form. No longer afraid, Kate scrutinized each coffin in quick succession. To her left lay a woman and baby. Then there was what might be a couple, without faces, then another woman with a face, or death mask, an encased infant placed in a hollow on her torso, then another couple, both with death masks. “My pleasure, Kate.” He smiled and performed a small bow.